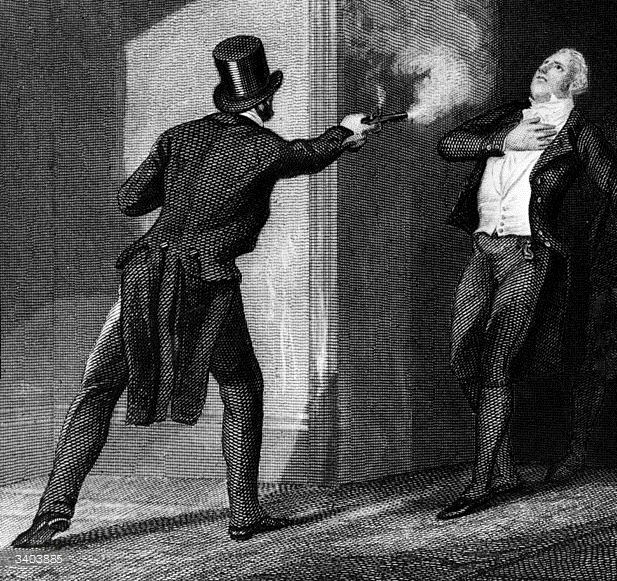 Spencer Perceval is the only British prime minister to have been assassinated. He became an MP on 9 May 1796. It was a year before he made his maiden speech. On 26 March 1807 the Duke of Portland appointed him Chancellor of the Exchequer. He moved into Number 10 two years later on 4 October 1809. At 5pm on 11 May 1812, John Bellingham, a 42-year-old salesman from St Neots, Huntingdonshire, walked into the Palace of Westminster and sat near the fireplace in the lobby of the Commons. In a specially designed 23 cm (9 in) deep pocket in his coat he had a pistol, and a second gun was concealed about his person. Bellingham bore a grudge against the government. In 1804 he had travelled to Archangel in Russia, then an important trading post with Britain, but events conspired against him and he was accused, wrongly, of fraud. He spent five years trying to prove his innocence and was furious at what he saw as a lack of help from the British authorities. The parliamentary business on 11 May 1812 was a discussion of embargoes on French trade so only about a tenth of the 658 honourable members were present. Perceval was supposed to be at the House at 4.30pm but was running late. Around the time that Bellingham was taking his seat in the lobby, Perceval was leaving Downing Street, having decided to walk to the House. As he arrived no one noticed John Bellingham as he stood up and slowly walked towards Perceval, withdrawing his pistol. He pointed the gun at the prime minister’s chest and fired. Perceval cried out, “I am murdered”, and fell to the floor. Perceval, 49, was carried to the Speaker’s House where he was placed on a table but it soon became apparent that he was dead. Rather than trying to escape, Bellingham resumed his place by the fireside before he was taken into custody. The inquest into Perceval’s death took place at 11am on 12 May 1812 at the Rose and Crown pub in Downing Street with a jury of 21 men. Bellingham was tried at the Old Bailey on 15 May 1812 and doorkeepers charged one guinea for admittance before realizing the huge demand for seats and raising the price to the three guineas. The first prosecution witness was William Smith, MP for Norwich and the grandfather of Florence Nightingale. The summing up by the judge, Lord Chief Justice Mansfield, was interrupted several times when heb broke down in tears. The verdict returned was guilty and Bellingham was condemned to death, his plea of insanity being rejected. On a rainy 18 May at 8am William Brunskill hanged him at Newgate Prison, London. In the bowel of the scaffold Brunskill’s assistants pulled on Bellingham’s legs to hasten his death.